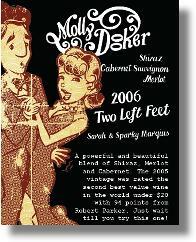 What comes After the Amazing Mollydooker 2005 Wines? After the cult-buzz of the Mollydooker 2005’s, there was a great deal of expectation when the current vintage hit the shelves. Between the “Two Left Feet” and “The Boxer”, I prefer the later. That is not to say the Two Left Feet isn’t a good wine…it is! In fact, both varieties are absolutely delicious for the price. The 2006 is a blend of Shiraz, Cabernet, and Merlot. Dark and inky, huge dark berry fruit explosion, heavy tannins. Do not serve at room temperature, as the alcohol comes through just a bit. Pair with something spicy, grilled, or BBQ. Recommended to drink within the next two years, as it will likely peak within that time. Overall, it was pleasantly enjoyable, and for the $20 range price tag, I would certainly recommend that you try at least one bottle. Make your own judgment, and please post your comments, as I would be very interested as to what others thought.